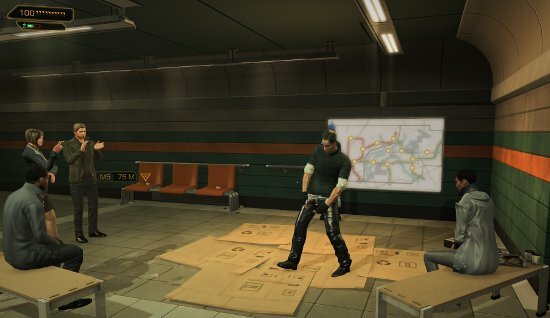 There’s a lot to like about Deus Ex: Human Revolution. It has the style and mood of Christopher Nolan’s post-Insomnia work: a moody action epic with brains, one that’s as interested in characters as it is in firefights and explosions. From the opening titles, Michael McCann’s score evokes Hans Zimmer’s work on films like Inception and Dark Knight, shot through with strains of Vangelis. 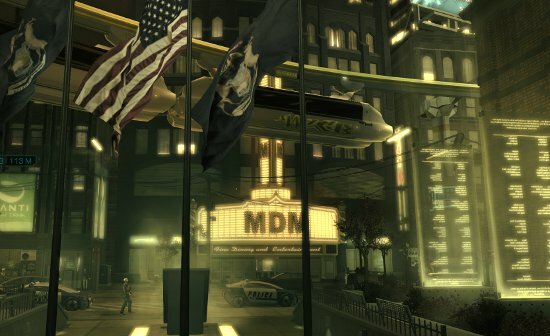 But there is one area where Human Revolution starts to look like a second-rate blockbuster: it’s gaudy, exhausting visuals and two-tone color visual scheme. This is an exhausting game to look at for 20 or so hours, and the tragically limited palette annihilates any hope of setting one location apart from another. To see what’s going on here, and it’s worth reading this great piece on digital color-grading in modern films. You’ll learn all about teal and orange, and why filmmakers distort their images toward those extremes. Now the funny thing about Human Revolution is that it wouldn’t seem like this should be a problem. 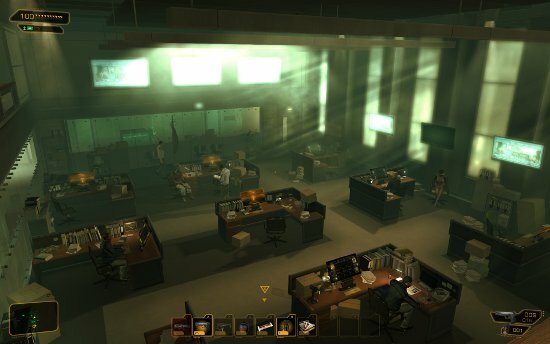 Unlike film, game developers don’t have to work with real actors or lighting. With film you can understand how a hack director might want his movie to look “better”, for actors to stand out more. A competent cinematographer and sense of visual style could also suffice for those purposes but, hey, Hollywood is Hollywood. Good thing every TV screen in the world is literally teal and orange. But, as in so many other things, games follow Hollywood straight over a cliff. 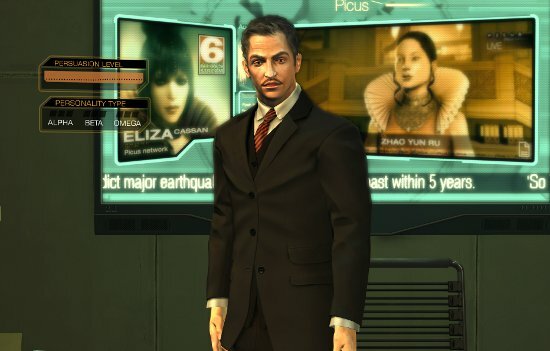 So we get Human Revolution: a very good game with some legitimately great touches, undercut by visuals that bend over backwards to emulate the same kind of visual drama we see in theaters every summer. Now the orange is obvious in Human Revolution, but if you look closely, you’ll see that every other shade of gray or green is slightly bent toward teal. Look at these pictures that showcase Human Revolution’s visual diversity. In isolation, this all looks cool. But this is nearly every scene in DE:HR. The subway has been redone in teal and orange, and the cardboard is nicely fluorescent. Notice that even the grays are greenish. And even the Illuminati can't resist orange lighting. A more desaturated scene, mercifully muting the palette, but it's still recognizable. The detectives' bureau at the police station appears to have been moved to Rapture. When my time is evenly divided between reading, writing, gaming, and cooking / dining, I am happy and productive. You would not think that should be difficult, considering my occupation and how much I enjoy all of those activities. Still, it seems like every couple months I find myself in need of a mental tune-up, usually after struggling for a couple weeks. I’m in the middle of that process right now, after a near-meltdown on Friday. I lost sight of the simple things that comprise my job and give me such pleasure. I always do, the moment I start to worry. Worry, self-doubt, and guilt are all old friends of mine, and like the dwarves at the start of The Hobbit, when the first knocks on the door, the rest are soon to follow. But at least this time I headed things off. I cancelled a project, requested a deadline extension, and took the night off with some Bad Company 2 and Farscape. Today I finds me playing an awful lot of Combat Mission: Battle For Normandy as I wrap up a review for PC Gamer. I’m very happy to report that I’m enjoying the game a lot more now, after a very rocky start, than I ever thought I would. Tonight we’ll be making some ratatouille and hopefully watching Fort Apache. Tomorrow I have a date with my D&D group, although I wonder if this is the right group for me. The group is very large, and our first session seem very combat-focused. I expect we’ll have fun tomorrow, as it is a terrific group of people, but I still hope for more of a narrative payoff in this session. 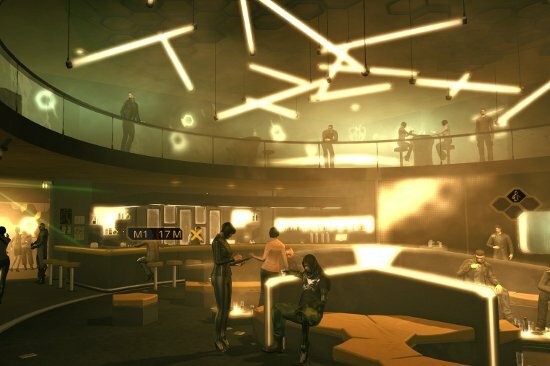 Next week, Deus Ex: Human Revolution comes out. I wish I could say I’ll be playing it on day one, but I think I’m going to start putting games off until after I make some upgrades to my PC. It’s still a fine gaming machine, and the aging PS3 and 360 ensure that it’s still capable of running modern games, but it’s not able to keep up with all the high-end options that games have today. I suspect after my upgrades, I’m going to have some catching-up to do in the fall and winter. My early review of Age of Empires Online went up at GamePro today, but there were a few things I didn’t have space to bring up in the main body. Here are a couple other moments from my review process. MK does not like the AoEO art style. She watched over my shoulder while I played it, and that’s when she delivered her verdict on what the graphics are communicating. I tend to agree. It’s too cute by half, all bright colors, and foreshortened models with adorably askew roof lines and frames. It’s so desperate to appear non-threatening that it’s grating. It further underlines the WoW / FarmVille aesthetic to which AoEO is so slavishly devoted. Again, free-to-play is a business model, not a style, so why must the formerly resplendent AoEO dress-up like a casual browser game? It’s patronizing, it’s conventional, and it’s just kind of ugly. I finally started doing some serious PvP in my waning hours with the game before filing my review. I focused on other issues in the review, but I’m noticing major problems. I’ve beaten a number of people not by playing better than they have, but because I have siege weapons and they don’t. It makes a huge difference. Taking down fortifications with infantry and cavalry takes forever, and in the meantime guard towers will slaughter the enemy in droves. The only practical way to deal with fortifications is to use siege weapons. That’s nothing new to AoEO and it’s part of good balance. The problem is, siege weapons don’t become available until level 10, and not everyone picks them right away. So I have had a number of games where I was able to turtle up behind guard towers, and then go shatter the enemy base once he’d exhausted himself against my defenses. That’s not fair, and it’s not fun for either party. But that’s what happens when you take a holistically-designed RTS and chop it into a fine dice. Because you only get to play with AoEO’s various pieces depending on your level, you would want to make sure that character are matched appropriately, right? Well, I’ve had a number of games where I’m fighting four levels down, which means my opponent is at a severe disadvantage. The real kicker is, you only get XP for winning. So it’s a rich-get-richer situation, as high level players pound the daylights out of low-level players, then level up faster. The chat window in the lower left corner of the screen is full of the stupidest, most vile people I’ve ever encountered in a strategy game. There are new players who holler questions into the general chat, questions that could be answered with a few seconds of thought or experiment. There are trolls, who flood the chat with racist invective, or just random keystrokes, breaking up any conversation. There are veterans who endlessly complain about the new people who have showed up to play “their” game. It’s a noise, unpleasant environment. Again, I think I would rather pay for a game that puts a wall between most of these people and me. A miraculous deadline extension brought my week to an end a few hours earlier than I anticipated, so now I find myself crashing after a week spent at nearly full-tilt working on a review and three columns. This was instructive: while I generally got my copy in on time, I didn’t allow sufficient time for the revision process to play out, which had a knock-on effect that came to a head today. This tells me that I’ve got the slack in my schedule in the wrong places. I need to look at the copy deadline as the halfway point in an assignment, not the conclusion. Anyway, I got my extension at the best possible moment: right after I’d finished writing my copy. Since the piece is finished, I can actually use the extra time to polish and find better art to accompany my piece. This is the best outcome. Early extensions have been known to be squandered on such literary pursuits as drinking in bars with friends, going to the movies, or trying to make it through a few more minutes of The Star Wars Christmas Special. Still, there is no rest for the freelancer. I must log a few more hours with Pride of Nations and work up a review this weekend, and go on a screenshot expedition deep into the heart of Alpha Centauri. I should also figure out what we are doing for this week’s 3MA, something I was too busy to deal with during the week. Beyond that, I’m going to use the weekend to finish up V for Vendetta, something I got distracted from by a copy of Ursula K. Le Guin’s A Wizard of Earthsea. I made the mistake of opening it, just to get a sense for what it might be, and the next thing I knew I was 50 pages in and utterly engrossed in the story. After V, I might move on to The Tombs of Atuan, or I might act on some of the excellent Terry Pratchett advice you guys supplied last week. Anyway, while I try to lay the foundations for a great week, you should peruse this piece I wrote for GWJ on The Darkness and listen to a great conversation that Troy and I had with Ars Technica’s Ben Kuchera. The discussion with Ben, in particular, is worth your time. I wanted a discussion that got beyond the usual, “Scores are broken, we resent Metacritic” nonsense and discuss our work from a procedural angle. What do we take with us in to a review? Who are we writing for, and what do we try to keep sight of as we work? One thing deserves some expanding on: rates. I have no idea what my peers are being paid per review, but with most places with whom I do business, bigger games get more space, and more space means a bigger payday. As a working writer, I have every incentive to chase after major releases and every incentive to pass on smaller games, because they are often not worth the time they would take to review. Now I still do a fair number of small reviews because, hey, strategy is a small niche and I genuinely want to cover games that other people might not be talking about. But I have also had to pass on work from a few outlets who want me to cover a neat looking independent strategy game for ridiculously low pay. By the word, it makes sense, but with certain genres like sports and strategy, the time I spend writing is a scant fraction of the time I spend playing. This creates an awkward middle ground. A lot of games that require some time-consuming work from a knowledgeable reviewer will not be lucrative enough for the people best qualified to discuss them. It also means that people who read review outlets are not getting the best service reviewers can provide: intelligent criticism of lesser-known games. A few times in the last year I have had to explain what my minimum rates are, and many outlets are unwilling to meet them for a minor title. They want the review, but not enough to pay for a considered, informed opinion. That’s a shame. Since before the Memorial Day Rabbitcon through today, I’ve been working at a fairly brisk pace. It’s gotten to the point that I actually need to go over my books and Friday and make sure I’m remembering all my invoices. It also means, as I have mentioned before, that it is harder to find things to say here. I write 5 columns a month, and most of what I play is either for review or 3MA, so there’s no need to opine here about any of that stuff. God, what a boring person I seem to be becoming. “Sorry, guys, all I talk about is games, and I do that for other places.” My original frustration with a lot of games writing was that it was so rarely in dialogue with broader culture and history. Now I am gunning out reviews and columns while a stack of unread books and unwatched films piles up behind me. Still, this is perhaps the wrong week to complain about this. I finished E.L. Doctorow’s The Waterworks and Susanne Collins The Hunger Games this week, and The Waterworks is nothing if not inspiring to a writer. I read the first and last dozen pages aloud, because the prose is so completely perfect and evocative. Not just of the time and place, but of the narrator’s character and the people who surround him. And then I went out to the indie film multiplex a few blocks from my apartment to see a Woody Allen film in a theater for the first time, Midnight in Paris, and a few nights later had a near-religious experience with Steve Gaynor and Chris Remo when we went to see Terrence Malick’s Tree of Life. Actually, scratch that. I’ve had religious experiences. A few dawn Masses when what the Church had to say and what I needed to hear perfectly aligned, or just those days that make pagans of us all, when the perfection and glory of creation seems sufficient proof of God, and spending a day under the open sky seems like the truest act of worship. Tree of Life wasn’t near-religious. By design, it is explicitly religious. Through the death of a child and the life of a family, Malick is addressing our relationship with Heavenly and earthly Fathers and Mothers. It was about as powerful a film as I have ever seen, the sort of film that lead to an unself-conscious conversation about what it is we are supposed to be doing with our lives and talents. What will make us proud in the twilight years to come. I guess I had things to say, after all. Maybe the danger of neglecting this space is not that I abandon my audience or become boring, but that I stop believing my mind is engaged with anything other than the workaday tasks for which I spend my Fridays editing and invoicing. That games become all there is, because that’s all I’m bothering to process. Anyway, I have hopes of this being a grand weekend. The Bruins play in just a moment. F1 is running at Montreal, one of my favorite tracks because it is so ridiculously fast with some truly devilish chicanes and turns that force drivers to the very edge of recklessness. Then there are the 24 Hours of Le Mans, which I will be trying to watch in between a number of podcast obligations. On top of all that, I will likely be playing The Darkness on my 360 and Pride of Nations on my PC. Not to mention catching up on my reading. My pal J.P. Grant did a great profile for Kill Screen on Greg Kasavin, who is working on one of the very few upcoming games for which I am genuinely excited: Bastion. The few minutes I spent with it suggested that it might be one of the best-written games of the year, and John does a fine job of showing why Kasavin is just the sort of person to make such a game. 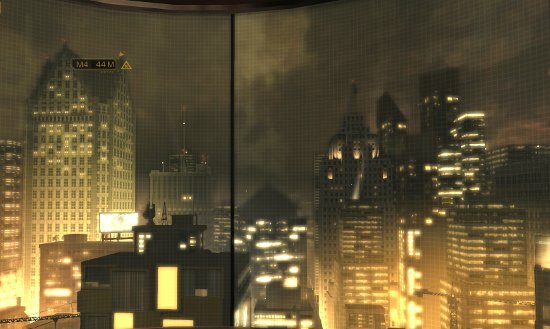 I also finished L.A. Noire and was finally able to start reading over the reviews, including Kirk Hamilton’s justly-praised Kill Screen piece. Kirk has an alternate-take on the game, and badly do I wish the game’s central conceit were as interesting and well-thought out. Team Bondi ultimately seemed to reach the same conclusion about Cole Phelps’ character, but the story is too slowly-developed, too literal to draw out Phelps’ real dilemma. It’s another busy weekend here. I just shut the door behind J.P. Grant after hours of great conversation and drinking, although I’m not sure I sold him on NHL 11. Or, more to the point, I’m not sure NHL 11 sold itself to him. The bottom line is that J.P. was dropped into a game with a huge number of controls and almost no explanation of how the pieces are supposed to fit together. And honestly, there was no easy way for me to explain what he was supposed to be doing. I’m still climbing NHL 11′s learning curve, and it took me several hours with it before I began feeling comfortable with the controls. This is not ideal for a game you’re trying to show to a friend and a fellow hockey fan after several rounds. Anyway, this weekend is likely to involve more board games with friends, the Turkish Grand Prix, and some Mount and Blade: With Fire and Sword for a review. That doesn’t leave much time for other gaming, or setting up the next 3MA, which I desperately need to do. My Tuesday column for Gamers With Jobs struck a more reflective note as I try to figure out what I want to do with myself over these next few, crucial years. This week’s Three Moves Ahead covers Revolution Under Siege, a surprisingly solid wargame about the Russian Civil War. And finally, I just saw that GamePro published a piece I did for an ongoing series in which writers advocate on behalf of their favorite series. Mine was, naturally enough, Civilization.